Are you craving new kitchen cabinets, but worried about the cost? With Cabinet Magic, it is possible to get the new look you want at a reasonable and affordable cost. Our secret? cabinet refacing in Cerritos CA. What Is Cabinet Refacing in Cerritos CA? Cabinet refacing in Cerritos CA is a type of remodeling that focuses on the visible parts of your cabinets. This obviously includes your cabinet doors and cabinet drawer fronts, as well as any crown molding you may have. Any other exposed cabinet surfaces, such as the outsides of corner or end cabinets, will also be updated. We typically cover these surfaces with a matching material so they look just like your new doors and drawer fronts. Your new cabinet doors and drawer fronts will be custom made just for you, to suit whatever design constraints you may have. We have the ability to fabricate any style of cabinet door along with a complete range of paint and stain options. To get new functionality as well as a new look from your cabinet refacing in Cerritos CA, you may want to consider getting new features like soft close hinges, drawer divider inserts, and pull-out shelves as part of the project. It’s Cost-Effective: Cabinet refacing will save you $$$ compared to complete cabinet replacement. But the finished look will be just as high quality. 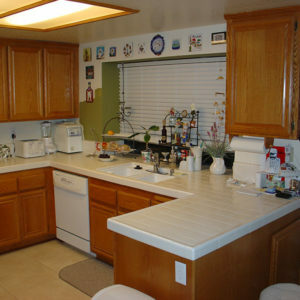 You can trust Cabinet Magic to transform your old cabinets with professional cabinet refacing in Cerritos CA. We provide unparalleled customer service and craftsmanship to help ensure you will be totally satisfied with your new kitchen. To learn more about how we can improve the look of your kitchen and what it will cost,Call 800-828-4380 and request your free in home estimate.